In this recipe, you will learn how to process multiband datasets with 3DF Zephyr. 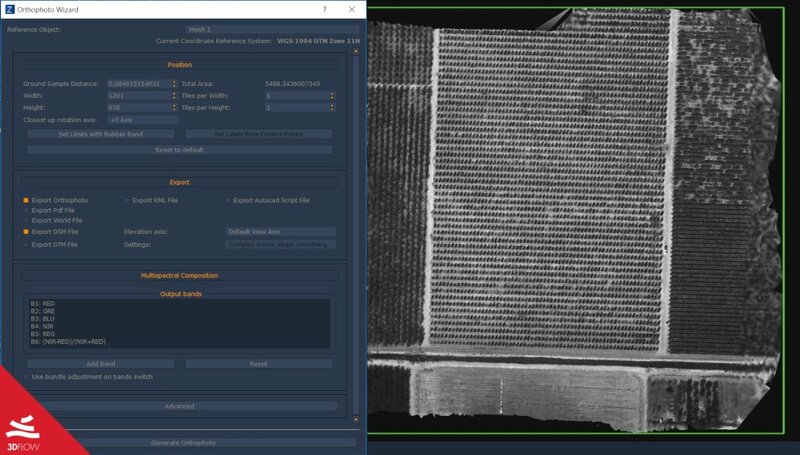 Although you can process multiple layers datasets with all 3DF Zephyr versions, in order to calibrate your RedEdge camera and to complete the full tutorial you require 3DF Zephyr Aerial. 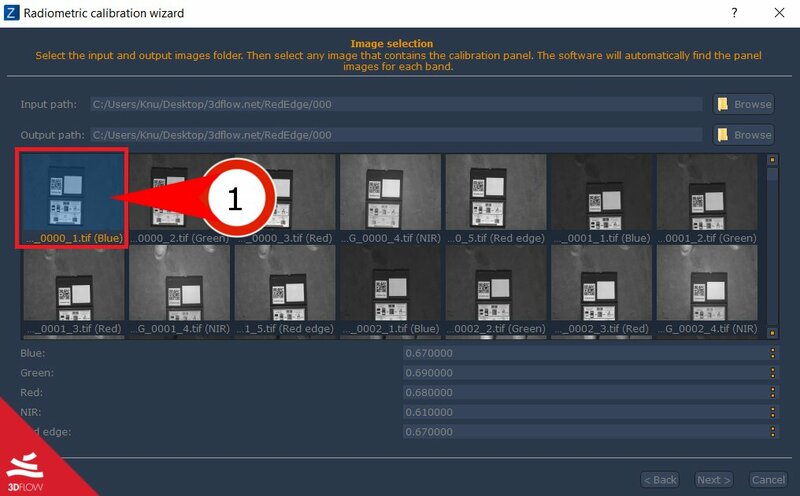 Although you can use any multispectral dataset (coming from any other device) in the same way, the following optional calibration process is specific for the RedEdge camera. Zephyr will automatically create layers based on the filename suffix, for example, filename_1.jpg filename_2.jpg are two bands (1,2) of the same photo (filename). If you don’t want to calibrate your camera or you are not using a RedEdge camera, you can skip to step 2. From the “Utilities” menu select “Multispectral” and then “Launch multispectral calibration”. In the calibration page browse to select your dataset input directory and the directory where the output calibration will be saved to. It is a good idea to use a different output directory unlike shown in the screenshot (but in case you want to, you’re allowed to do so). Select the best capture of the calibration panel (1) and then click next. For each detected band – grouped in tabs (2) – you will have to draw a rectangle (3) by holding down the left mouse button and dragging the mouse. Ensure that the rectangle is only drawn over the inside of the panel. Once you have repeated this step for all the five bands, the Next Button (4) will be enabled and you’ll be able to click it. Click the Next Button (4) when ready to run the calibration. 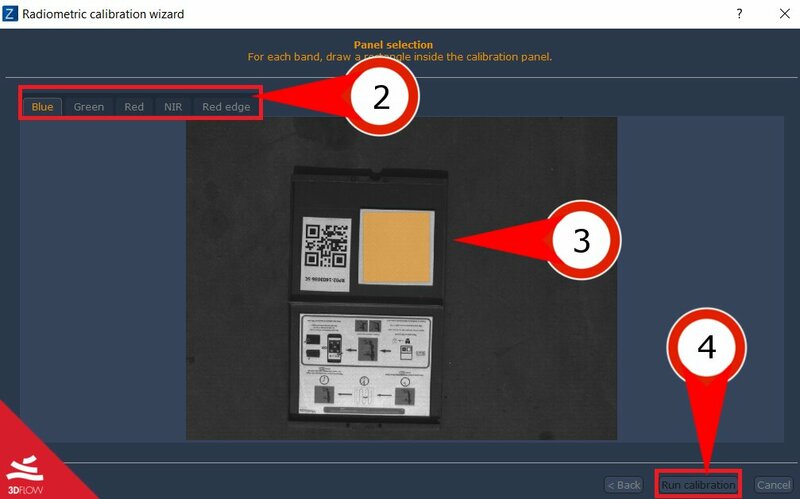 Once the calibration process has finished, you can double click any image to see the result of the calibration or simply click finish to end the calibration process. 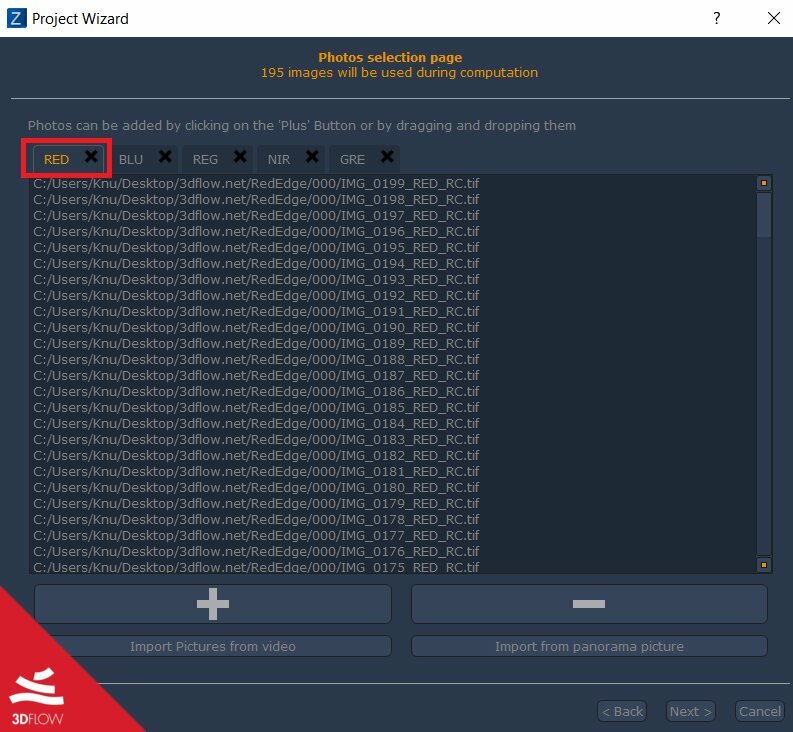 In order to create a multiband project in Zephyr, all you have to do is add the images in the new project wizard (no need to add the panel images: they have been processed already). Zephyr will automatically detect that there are multiple layers (if the filenames have an appropriate suffix, as explained above) and ask you if you wish to create multiple layers. Select yes. Note how you can still manage layers manually if you wish to do so. The usual reconstruction wizard will appear. Select the appropriate reconstruction options for your dataset if you wish, and then click next. Layers (bands in this case) will be automatically grouped once again. The main band (on which the Structure from Motion process will take place) will be automatically detected (if you followed the calibration step, the red band will be automatically recognized) and will be shown as the leftmost tab. If you wish, you can change the main layer by right clicking the image list of the appropriate tab and selecting “set as main”. Band information are stored in the workspace and can be used for further processing by 3DF Zephyr. 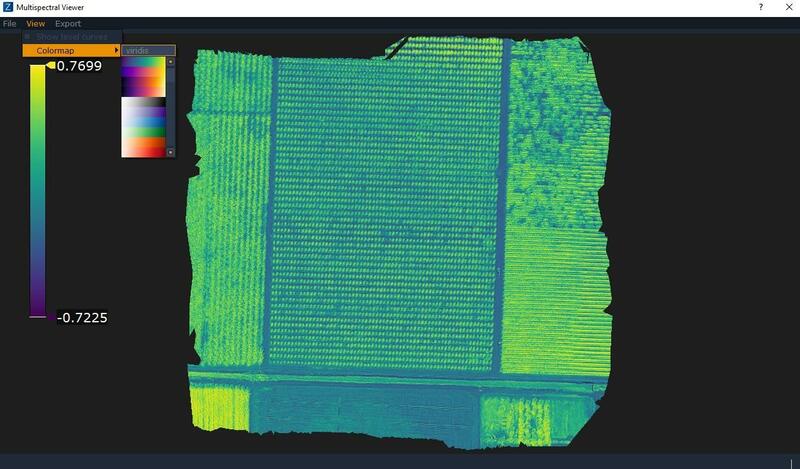 When generating an orthophoto, for example, Zephyr will automatically preset the output bands as R,G,B,NIR,RE,NDVI – you can choose the desired output band with the dropdown selection box. You can customize the output band formula by clicking “add band” and by defining your own formula. Please note how Zephyr includes an index calculator and remember that you can also generate DEM files and view them directly in Zephyr. 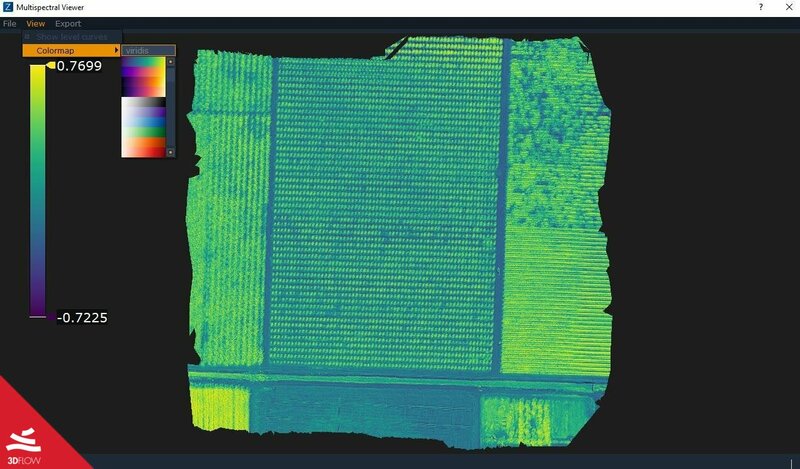 The generated orthophoto can then be viewed directly in 3DF Zephyr in the included multispectral viewer utility (of course if you also have generated the dem file you can still view it as usual). The default colormap is viridis however you can select a different one at any time from the “view” -> “colormap” menu.